The photo above is a 'snapshot' of some of today's headline articles in the Express. 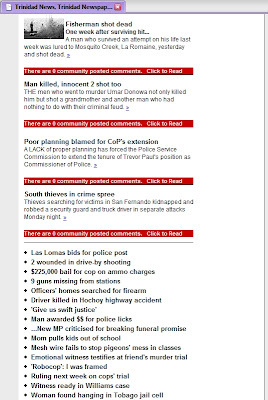 In the space available on my monitor screen, there are approximately 15 stories directly related to crime. Anyone thinks the crime situation will be improved by retaining duncey Paul, or having Martin Joseph as security minister? My personal take - hold yuh heads and bawl like 40 Tarzans, the storm now coming.